According to Chef Devaux handrolls are among the easiest to make and the best to eat. 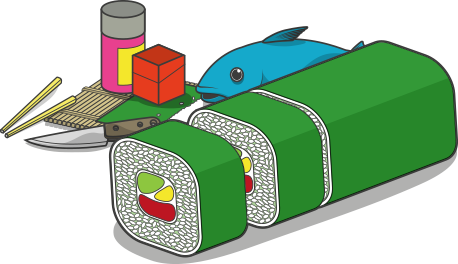 The nori stays at its best, because the roll is not compacted. There’s not much contact with the rice, as a result the nori stays dry and crispy. Just as it should be. Put the crab shell side down on the cutting board. Cut it in half at an angle. This creates a triangular shape that easily fits into the roll. Cover both halves in flour. Do this thoroughly, because the crab will be deep fried with tempura batter. This batter doesn’t stick well to wet surfaces, the flour helps dry the outside of the crab. Take 100 grams of ready-made tempura flour mix. Add 160 ml of ice-cold water and mix it. Ice-cold water is best because it will result in some nice air pockets when it comes in contact with the hot oil. Don’t use a mixer or whisk. Instead simply mix it with a fork. Lumps in the batter are no problem. In fact, lumps are preferable, they’ll form little pockets of crispness. If you overmix the batter, you’ll get a lot of gluten. That makes the batter heavy and results in non-crispy tempura. Dip the crab into the tempura batter mix. Deep fry the crab in hot oil of 170-180 °C (338-356 °F). Fry 1 or 2 pieces of crab at the same time. If you put more pieces of crab in the oil, the temperature will lower too much, resulting in soggy tempura crab. Flip the crab around a few times, to let it fry evenly on all sides. Fry for 3 minutes, until the tempura cab is golden brown. Remove the crab from the oil and let it dry on a piece of paper towel. You can also make your own tempura mix. Mix 1 cup of flour with 1 teaspoon of baking soda and 2 tablespoons of potato starch. Sift the ingredients. Add 1 egg and 240 ml ice-cold water. Stir a little and use immediately. A recipe without egg: mix 1 cup (125 gram) of flour with 1 tablespoon rice flour and 1 tablespoon corn starch. Sift all ingredients, mix well and store in an airtight jar. To use it, take 1 cup of the mix, add ½ cup of ice cold water, stir a little and use immediately. Take half a sheet of nori and place it on the cutting board. Put 40 grams of cooked and seasoned sushi rice diagonally in a corner of the nori. Add a little bit of (freshly grated) wasabi, 1 tablespoon of kewpie mayonnaise and 1 tablespoon of sweet chili sauce. Place the fried crab on top with the leg facing upwards. Add 2 slices of red bell pepper and 1 slice of avocado. Roll the roll by starting in the corner where you put all the ingredients. Roll it in a kind of cone shape. When there’s a small piece of nori left to roll, stick a grain of cooked sushi rice on it. This will serve as glue, which will help you seal the roll. Add 1 tablespoon of tobikko. Put in a gap between the nori and the other ingredients, so that the roe stays inside the roll when you lay it on its side. That’s it. 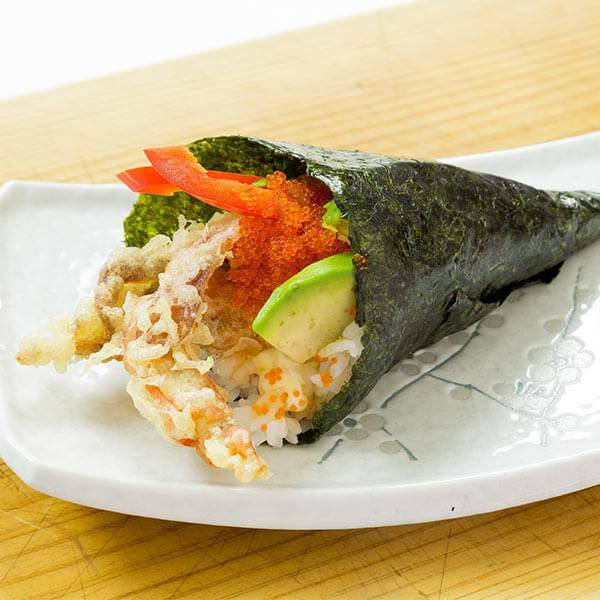 Enjoy this delicious soft-shell crab temaki handroll! January 14, 2013 Crab "Kani"